A chill has set in between Moscow-Kiev ties, says the results of a new poll. Only four per cent of Russians describe relations between Moscow and Kiev as “friendly,” an independent pollster said Wednesday. However, 54 per cent used negative terms: 31 per cent said relations were “chilly,” 21 percent “tense” and two per cent “hostile”. 6 per cent did not answer. Only 10 per cent of respondents used stronger terms, with 6 per cent describing their opinion of Ukraine as “very positive” and 4 per cent saying it was “very negative”. The rest gave no response. The survey of 1,603 people from 130 cities and towns in 45 regions was conducted from January 24-27. The margin of error was no more than 3.4 per cent. 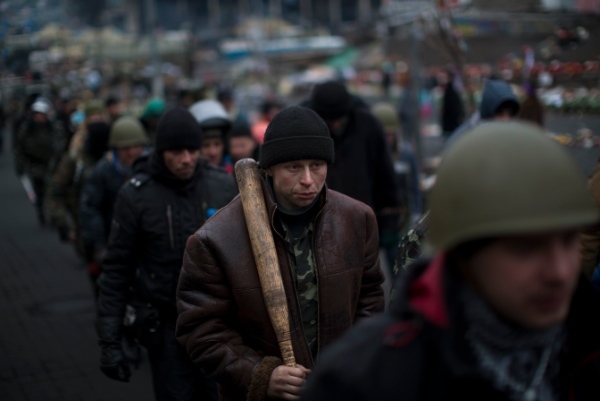 Ukraine has been consumed by a three-month-long political crisis. President Viktor Yanukovych and protest leaders signed an agreement last week to end the conflict that left more than 80 people dead in just a few days in Kiev. Shortly after, Yanukovych fled the capital for his powerbase in eastern Ukraine but his exact whereabouts are unknown. Ukraine’s protest leaders have already named the ministers they want to form a new government following the overthrow of President Viktor Yanukovich. Following the unrest, Ukraine’s hryvnia currency has tumbled 5 per cent since January 1.